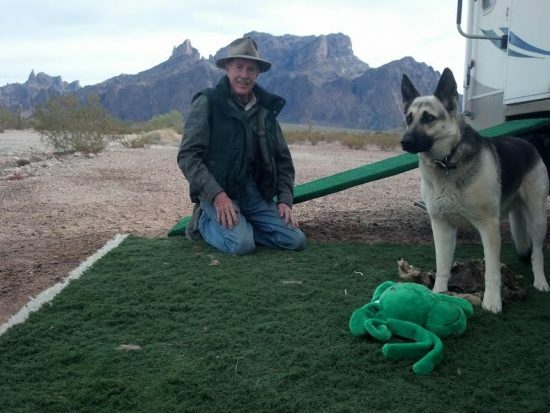 Longtime Palm Springs resident Jim Toenjes took off in his trailer four years ago, with his paints and his German Shepherd Greta by his side. His itinerant lifestyle resembles that of the early desert artists who made a seasonal circuit from Palm Springs to the Arizona Navajo country and then up to the Sierra in summer. It’s a life many of us envy, and in this Q&A Jim tells us what it’s like being a painter At Large in the World, as he calls himself. —Many people would be hesitant to go nomadic for fear of being too cold, too hot or feeling rootless. Did you get comfortable with camping and roaming while growing up or while doing archaeological field work? We had the usual static home life during most of the year when I was growing up, but took summer vacations every year to different parts of the West. That, and my childhood interest in archaeology and museums showed me early on the world was very big in space and time. After graduating at the University of California at Santa Cruz, I began traveling as a professional archaeologist. I worked for over 20 years in California and Hawaii and worked for several years with Dr. Lowell Bean assisting him with ethnographic research and historical perspectives of Palm Springs. Every turn of the corner has had fresh challenges and that has helped me with my current lifestyle. Jim Toenjes painting in his trailer. With Greta, I am always at home wherever we wind up. Having the freedom to choose our environment at any time, we, like so many other “snowbirds,” follow the sun. It optimizes our comfort level and keeps us alert to options both long-term and of the moment. —Did you make any modifications to your trailer to make it into a mobile studio? The interiors of trailers offer very little option for activities other than cooking, eating, sleeping, and watching television. As I have never really had a studio, this did not pose much of a problem. I did, however, immediately get rid of the television set that came with the rig, as well as two easy chairs at the back end. I replaced them with a small folding table and a plastic cabinet for art supplies. When the weather is inclement, I sometimes like to experiment, and this small area is useful for that purpose. —How did it happen that you first took to the road? I remember you started traveling after the sale of your childhood home. When I made the decision to sell the house, I knew instantly this would be the life for me. My mother was an artist and we often talked about the adventure of traveling and painting. She was a wonderful traveling companion, and we made RV trips to the Southwest and Midwest together as well as a summer trip to Britain and northern Europe in 1981. While the house was in escrow, I stayed at my aunt’s in Rancho Mirage. I had already selected a fifth wheel and truck to pull it. When escrow closed I was able to purchase both and spent a week in a trailer park getting used to the routine and new mode of living. After acquiring a few dents and dings, I headed up north to visit a friend in Groveland just outside of Yosemite. I spent that winter boondocking in the Borrego Desert and from there went up to the Mojave National Preserve. —You’ve spent a lot of time in Quartzsite, Arizona. Who are your neighbors, and what are some of the quirks of Quartzsite life? I first came down to Quartzsite in the fall of 2013 after a season spent in the Mojave National Preserve as an archaeologist and artist-in-residence at the historic OX Ranch. The winter season had yet to start so I got to know the town while it was easy to get around. 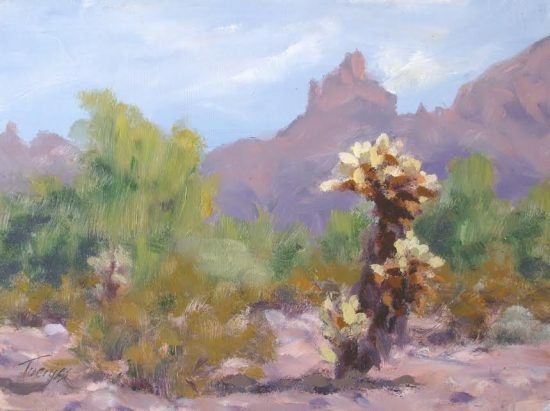 I rented space for a vending site to sell miniature plein-air paintings of the desert. I had very friendly neighbors and though none of us did very well, the whole episode was quite entertaining. Last year, I signed up with the Quartzsite Art Guild. The members were all very welcoming and I joined them in their January 2016 art show. They were one of the best organized groups I have witnessed. The artwork was quite varied and colorful. A few pieces sold, but the low turnout was similar to what most other businesses in town were experiencing. It is also difficult to find buyers in a town where most people live in motorhomes or RVs. There simply is no room on the walls. I made up a flyer for Pet Portraits and distributed them. I stopped at the RV service station and asked one fellow working there where I might put one up, and he told me to go to the bars. Of course that’s what he would do with or without a flyer. I priced them at $40 for an 8 by 10 and of course won’t make much from that, but I’ll bet it’s still too high for most people here. Even those in $200,000 rigs. The best known musician in town is Paul Winer, a professional from New York who came here decades ago. He plays keyboard at many events and dresses for the occasion. He is otherwise known as The Naked Bookseller. And he’s naked as a Jay except for a little brown garment connected to a string around his waist. He must be 70 or better by now and skinny as a rail and shiny brown like tanned leather. 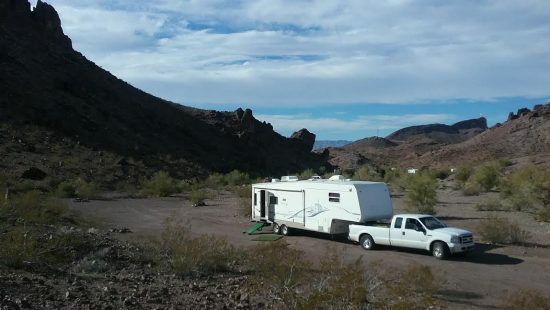 While there are many full-time boondockers like myself camped in 14-day free stay areas, or in long term BLM sites with water and sewage, many other visitors are here for a few weeks of Arizona winter and reside in full amenity campgrounds. In addition to a small but growing number of street people, quite a few people are living out of their cars and/or tents. 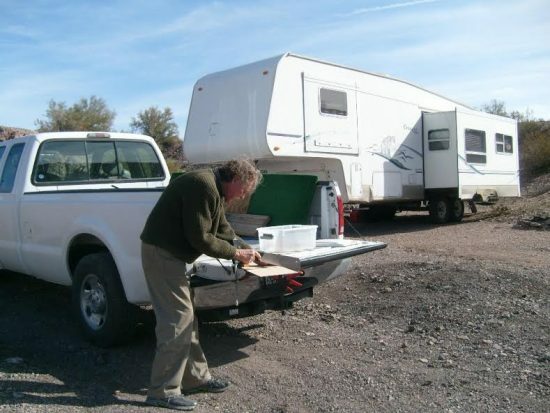 The majority, however, have campers, 5th wheel trailers, and Class A motorhomes. The economic range is all the way from affluent to lost-everything-but-the-will-to-live. And regardless of portfolio, everyone out here squeezes a nickel till it chokes. Most people, whether full-time or snowbirds, hail from the north and mid-west of the country or from Canada. Though most of the population depends heavily on social security, the political climate appears to be strongly conservative, independent, or disinterested. —What are the challenges of painting on the road? The challenge for me is twofold. Environmentally, it’s finding a scenic area with interesting topography for plein air work where camping is allowed and access is not too difficult. The Bureau of Land Management and National Forest Service allow dispersed camping for 14 days free in primitive sites. Secondly, because of the limited space in my trailer, there is little room for studio work or for storing paintings and supplies. Consequently most of the work I do is in the six by eight to 12 by 16 inch range. It is also difficult finding places to display my work, as most small towns with galleries limit their space to local artists and many galleries today prefer abstract work to landscapes. Water is always a challenge. I save a lot during kitchen clean up by spraying everything down with a mixture of water and Clorox and then wiping everything clean. When it rains I rig up a simple catchment system. I rigged up a tarp between my trailer and truck during the last rain and collected 22 gallons of sweet rain water–saved me a long trip into town. —Tell us about mealtime on the road. My meals are all one pot meals, with either pasta and greens or beans and greens. The only trouble with pasta is that the cooking water has to be thrown out and that is so much water wasted. Breakfast is a big pot of oatmeal with apple, ground flax, and chia seed. Green tea or Mexican coffee (instant coffee with brown sugar, milk and vanilla). I also enjoy baking cookies, muffins or cakes for which I get recipes online. Ran out of bread recently, so, for tuna sandwiches I substituted tortillas. I get a great tuna salad wrap that way. Great for packing in the field. —You’ve seen a lot of the So Cal desert in your travels. Do you have new favorite locations for painting or camping? Since I spend the winters in Arizona and the summers in Washington, most of my time in California is travel time. I have, however found the BLM controlled Alabama Hills outside of Lone Pine, California to be spectacular and a very inviting place for boondocking. The town of Lone Pine is also quaint and lively with Mount Whitney tourism. All along the way on Highway 395 to the north end of the state there is beautiful scenery. Another special place is the Gold Country around Sonora and Jamestown. 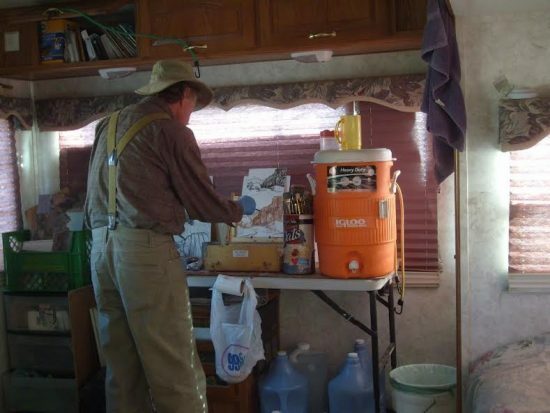 Boondocking, however, is not easy and requires a bit of research. The little town of Copperopolis in that area is very special. I have given several painting workshops there out of the Town Hall Arts Gallery and Studio. Larry and Susie, the owners, maintain a lovely gallery and the best assortment of art supplies in the entire region. —Tell us about your choice of subjects and colors. You seem to like washes (like Swinnerton and the early guys) and you often choose understated subjects and colors, rather than grand vistas and Technicolor sunsets. I began painting in the Palm Springs area. Not long after I begin painting, I became very attracted to the greyed palette of many of the early 20th century painters. 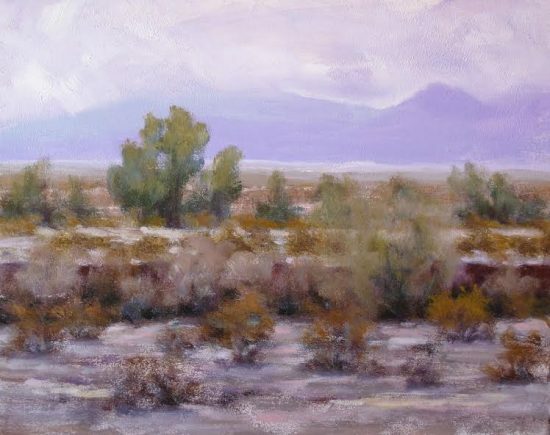 I tried adding grey to my colors, and also practiced with some of the color management Edgar Payne describes in his book, Composition of Outdoor Painting. In the late nineties I began painting with a reduced palette of secondary colors and white. Each pair of secondaries produces a mixture dominated by a primary and countered by its complement. From mixtures of these colors I was able to get a very pleasing blue and a natural brick red that worked well in landscape compositions. The remaining primary, yellow, could not be satisfactorily achieved, and so I added a cadmium yellow to the palette. I do not need blue and except for very specific circumstances, I do not use red. Currently my core palette is dioxazine violet, pthalocyanine green, monoazo orange, various yellows, and titanium white. Most of my camping is done on BLM land in the desert areas and Forest Service land in Northern California and on up into Washington. Spectacular vistas or subject matter are not often found where I am able to camp, though every place I camp is very paintable. 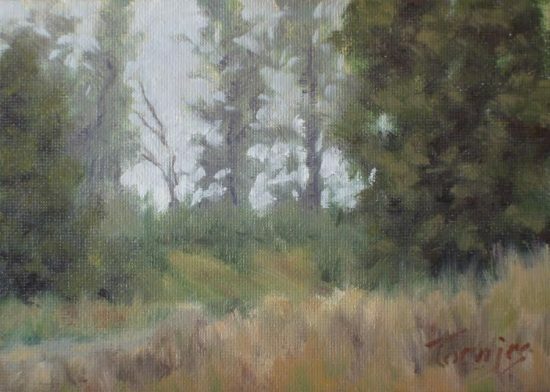 I paint outdoors within walking distance of my house, and paint the scenes I come upon with the colors I see in them. Very often, they are naturally subdued in color. Boosting the chromatic intensity might enliven the painting, but it would not be true to the place. To me, and I am sure to most other outdoor painters, the studio is the place for such adjustments. —Can you describe your circuit…Quartzsite, Kofa mountains, Woodland, etc. I like the way you refer to yourself as “migratory” rather than nomadic. I quickly settled in to the north in the summer, south in the winter pattern common to most full-timers. Trailers being necessarily light weight and limited in space are very poorly insulated. It is dangerously hot inside a trailer in the desert summer even with a swamp cooler. Air conditioning requires a major investment in solar power equipment or campground electrical hookup. For me, travel to cooler climes is not only the most feasible, but also the most rewarding and productive in terms of painting. In the same way, winters in the north country are very uncomfortable due to the cold and rain, and it is much more affordable to travel south to the desert. My pattern has been winters in the Quartzsite, AZ area from mid-November to late March, followed by a leisurely heading north along CA Hwy 395. I have recently made Lone Pine and the Alabama Hills a much anticipated stop along the way. Then, in early May I have stayed over in Gold Country giving workshops in Copperopolis and Sonora. I have a friend in Groveland just west of Yosemite I visit and am able to camp on U.S. Forest Service land nearby. I then head up I-5 through northern California and Oregon and into Washington. My return in the fall is a reversal of this route with another workshop in Copperopolis and 2-3 weeks more in the Alabama Hills. —What are your summer quarters in Woodland, Washington like? The colors are very different there. 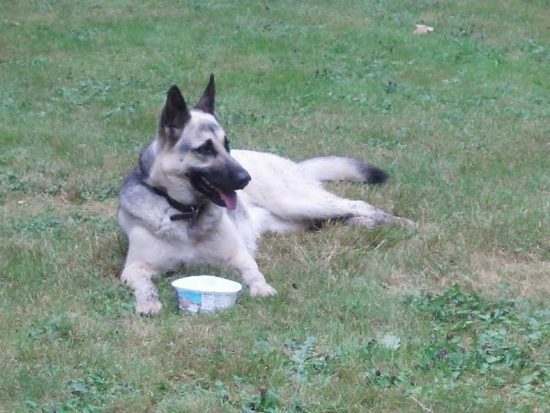 I have been welcome to stay summers with my father’s cousin, Carol and her husband, Jim in Woodland, Washington. They have a home on several acres of a once much larger parcel settled by her father, Lawrence Toenjes, shortly after the First World War. There is room on their land for my trailer where Greta and I keep our quarters, though I frequently take my meals at the house. Carol and Jim are both retired but very active. She sews remarkable quilts and has a lot of genealogical data, and Jim is a landscape painter so we have much in common and for me, at least, the summers pass all too quickly. The color of southern Washington in the summer is dominated by the many variants of green, nearly the complete opposite of the desert, but that is less an adjustment than what to me is a constriction of space and diminished patterning. The tall oaks and evergreens dominate many view opportunities limiting the sense of distance and atmosphere so prevalent in the desert. The differences that registers most with me between the two regimes is in chromatic range. 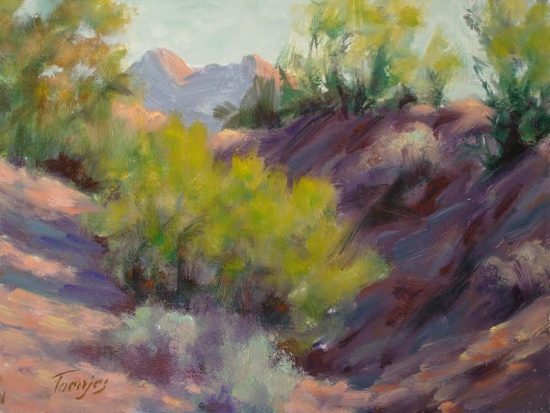 In the desert, mountains of rose, orange and ochre with shadows of violet and blue invigorate the palette and green is nearly always present for relief among the orange, red and purple of the soil. In the northwest, violet and green dominate with yellow as relief. Reds and oranges are always to be sought for and must at times be invented to give vitality to the green. —Has your work changed since being on the road? My physical horizons have expanded and with that I have had more to observe and analyze. I cannot say that my style has changed. It is still essentially descriptive, though I would like to expand into a more interpretive vein. I find I tend to see in the landscape fused color or colored grays. My limited palette of secondaries allows me to match what I see very quickly, but at the sacrifice of tension I could achieve by juxtaposing the contributing colors rather than mixing them. As, for example, placing dabs of similar values of green and orange adjacent to each other as opposed to mixing them as I do to get a particular tree color. 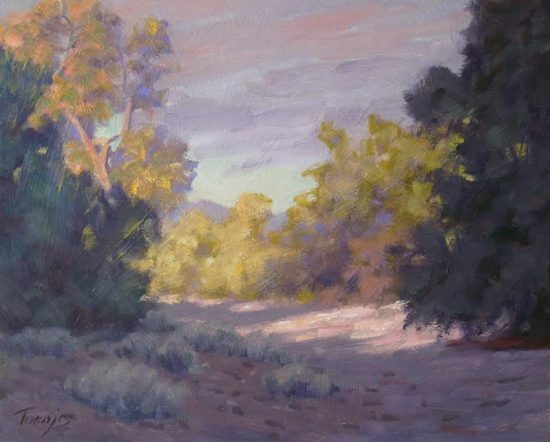 This impressionistic approach is a more colorful language, but requires analysis and practice to use efficiently in the field. —Do you see the landscape differently now that you’re mobile, as compared to living fulltime in Palm Springs? Over the years, the landscape in Palm Springs has become very urbanized. 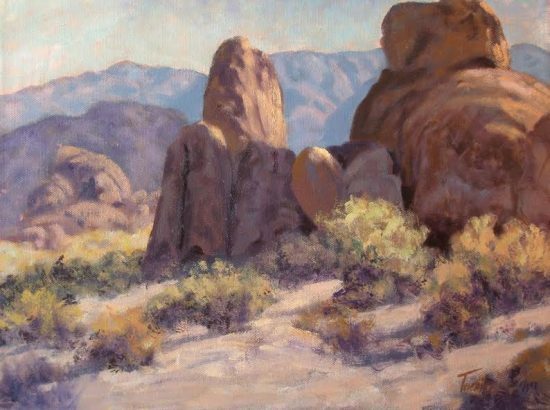 I felt most comfortable painting in the lower Palm Canyon wash area the last few years I lived there. Now that I have been on the road I have found many places where Greta and I can be out and free to go anywhere. Places that might at one time have seemed overwhelming in scope now feel like home to me. Opportunities for painting are what are now overwhelming. Loved this, thanks so much for sharing. Sounds like a great life. beautiful “lived in” paintings, wonderful and well chosen life style… with greta ridin’ shotgun! thank you ann. Really good article. I’d like to try that sort of life style myself. Take care and keep in touch. Where are you now?